Boy oh boy do I have a delicious treat for you guys today! When Philadelphia Cream Cheese asked me to help them come up with a special Easter brunch recipe, I had pineapple on the brain. I don’t know- it’s just, when I think of Easter, I think of this pineapple-cream-cheese-lime-Jell-O™-mold-thing that was always served every year on Easter Sunday when I was a kid. We’d have that, and ham, and buttery Parker House rolls from the freezer section. All of those fruity, yeasty and creamy tastes were just so comforting and special and delicious. So, today’s recipe is all about recreating those incredible springtime Easter flavors in brunch form. I can’t say enough good things about these sweet rolls. The dough recipe is exactly like a Cinnabon. Truly. I have never come across another cinnamon roll recipe that nails the flavor and texture more dead-on. I’m talking gooey, yeasty, and rich. It’s pretty simple to throw together with just a few pantry staples, but you’ll want to plan ahead because there is a good bit of down time while you let the dough rise. Using fresh pineapple in the filling gives these rolls the most incredibly sweet, tropical flavor! I know those big ol’ prickly things can be a little intimidating, but I promise you, cutting a whole pineapple is not a big deal at all if you know what you’re doing. I created a little video in my last post to show you just how fast and simple it can be. You’re looking at less than 4 minutes! Your guest will swoon when they taste these! 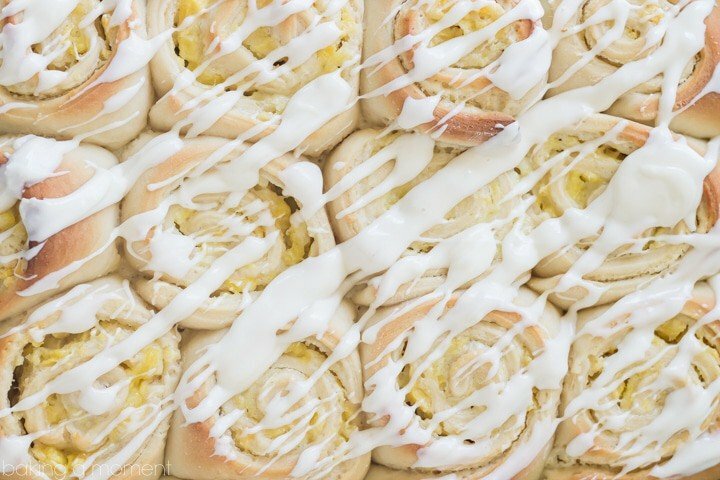 Serve a warm pan of these pineapple cream cheese sweet rolls at your next brunch- they are truly unforgettable! Sweet, tender yeast rolls wwirled with a luscious pineapple cream cheese filling, topped with tangy cream cheese frosting. 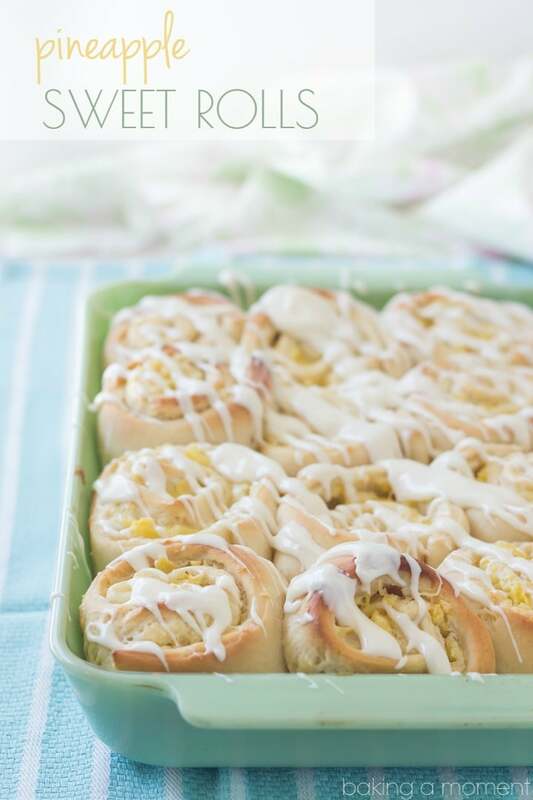 This tropical twist on the classic cinnamon roll is sure to be a hit at your next brunch! Place the warm water and sugar in a large mixing bowl, and sprinkle the yeast over the surface. Set aside for 5 minutes and allow the yeast to get foamy. Combine the oil, buttermilk, egg, and salt in a liquid measuring cup and stir together with a fork. Add to the yeast and water mixture, stirring to combine. Place the dough in a lightly oiled bowl and cover with plastic wrap. Allow to rise in a warm place, for 1-2 hours. Place the cream cheese, butter, and powdered sugar in a mixing bowl and beat on medium speed until fluffy. Stir in the chopped pineapple. Lightly mist a 9x13-inch glass baking dish with non-stick spray. Sprinkle the work surface with flour and pat the dough into a rectangle shape. Roll the dough out to a thickness of about 1/8-inch. Spread the filling evenly over the surface. Working from one long edge, carefully roll the dough into a log. Cut the log into 12 equal portions, and place each roll, cut side down, into the prepared dish. Allow the rolls to rise, in a warm place, for one hour. Preheat the oven to 350 degrees F and bake the rolls for 20-25 minutes, or until they are puffed and golden. Cool for 30 minutes, then drizzle with icing. Beat the cream cheese and powdered sugar together until smooth. Allie, I love these pineapple cream cheese sweet rolls!!! love the tropical twist!!! I want these at my next brunch!! so beautiful! Thank you so much Alice! My son was in love with these- he said they were the best thing I’ve ever made, lol! Hope you’re enjoying your time in Dallas sweetie! Wish I had one in front of me right now! Love that you put fresh pineapple in a sweet roll! Thanks Jessica! They were a big hit with my kiddos. So glad you like them; thanks for the sweet comment, dear! Get outta town! These look fan-freaking-tastic. Thanks Jennie! My son went CRAZY for them, lol! I love the combination of pineapple and cream cheese! This is such a wonderful treat for Easter and you’re pictures are just stunning! These look and sound so delicious, I love pineapple. I do too, Janette! It’s definitely one of my favorite fruits. So happy you liked; thank you!! I Love these sweet rolls!!!!!!!! I love these rolls! The pineapple and cream cheese sound like a fantastic duo. This is so fresh and beautiful. I would love one of these right out of the oven. Those are about the happiest, spring-time pictures I can imagine! And the texture of your sweet rolls looks absolutely perfect. Then the pineapple!!!! 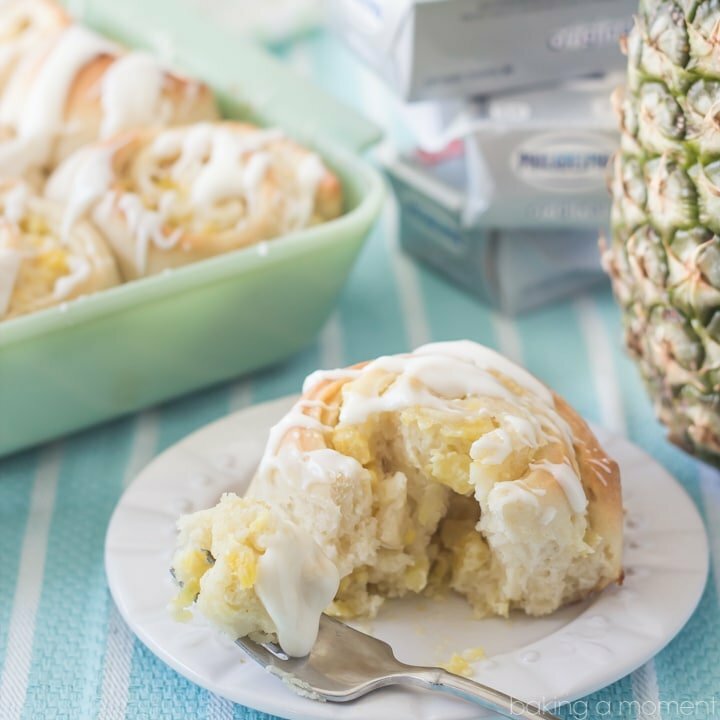 Genius to add pineapple to sweet rolls. Love this, Allie! Yummm! Pineapple + cream cheese sounds heavenly for breakfast! Pineapple’s been on my brain a lot lately, so it’s like you read my mind! These look so soft and fluffy — pinned! Thank you so much for pinning Marcie! I feel the same way about pineapple. For some reason it just says spring to me! Pineapple cream cheese?!? I am SO THERE! This look so good Allie, like a little plate of sunshine. YUM! These are the perfect sweet rolls! I love how soft and tender they look and that fresh tropical pineapple filling sounds heavenly! They totally scream spring and I can just imagine how amazing your house must have smelled while these were baking up 🙂 <3 these! Thanks Kelly! It did smell so good baking… hm I think I need to make them again, lol! 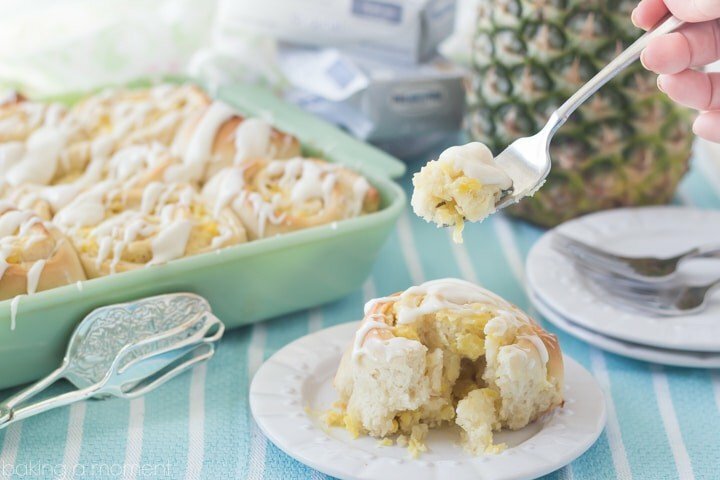 These sweet rolls look phenomenal, and the addition of pineapple sounds downright dreamy. I love the colors in these photos, too! Allie, these look so amazing – light, fluffy, and full of pineapple goodness! 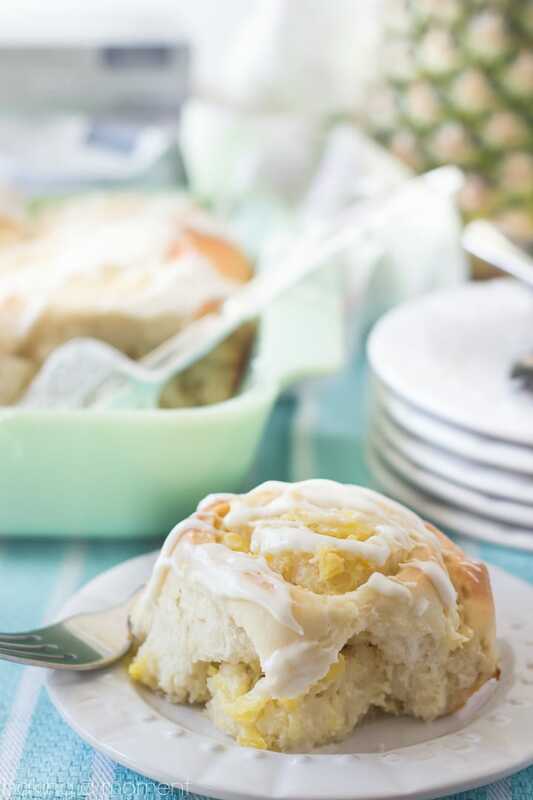 The addition of pineapple gives already-delicious cinnamon rolls a spring/summer makeover. And that cream cheese glaze looks absolutely amazing paired with the sweet pineapple filling. I’m always so amazed by how ingrained food memories can be – for you it’s pineapple at Easter and for me, a Thanksgiving cannot pass without pecan pie in one form or another! Yes! So true! Food memories are so powerful. And I just love how nostalgic it can be when you taste something, and it brings you right back. Thanks so much Aida! These look insanely amazing! I love the combo of cream cheese and pineapple in them. And they look so light and fluffy! Swoon. They are! Light, fluffy, and gooey. Culinary Couture know’s what’s up when it comes to sweet rolls 😉 Thanks Steph! Such delicious looking rolls! Love how you added fresh pineapple in there! Yumm. The pineapple was sooooo good Ami! Just tasted like Easter to me 😉 Thanks! Allie, these rolls are a thing of glory. I’ve never thought to mix pineapple and cream cheese before, but now I want to mix it in everything! Straight up so good! I adore the idea of pineapple in a bun. Such a great item to put out for brunch. Love the photo set up Allie. Just beautiful. Thank you so much Melanie! You too sweetie! This sounds do good! I love the addition of pineapple to these sweet rolls. I’ve been craving tropical fruits lately, and pineapple seems to be having a moment– between the resurgence of pineapple gum syrup, tiki drinks, etc. This might be just the recipe I need! Well, you had me from your first photo, Allie, but then you definitely had me when you mentioned Cinnabon! Oh my goodness ..it’s so delicious. Unfortunately we don’t have Cinnamon over here in the UK, so the only work-around is to make my own. 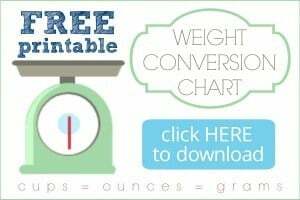 Pinning these for later! Skinny?? No thank you! If I’m going to eat a sweet roll skinny had better not have anything to do with it, lol! Thank you so much Kelsey! Your Easter dinner as a kid sounds a whole lot like mine, Allie! 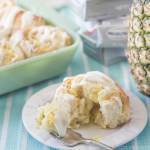 I LOVE pineapple and love that you threw it into a sweet roll! Pinned! I’m not too surprised Justine! From the sounds of it we both had very similar upbringing 😉 I’m so happy that you liked these- thank you so much for pinning! Now I know why you were teaching us all to carve a pineapple, heh heh! But how gorgeous are these pineapple sweet rolls? And you know, there are some things (fewer and fewer the longer I blog, ha ha) that I will buy generic, but cream cheese isn’t one of them. It has to be Philadelphia. Even if I’m paying 50%-100% more… I just like it better. You can’t have astonishingly great food if you start with mediocre ingredients! I couldn’t agree with you more Meggan! If I’m going to splurge on a sinful dessert, it better darn well be the best it can be. Thanks so much for the great feedback sweetie! These look absolutely amazing!! Pinned! Also I want that mint colored baking dish!! Wow, I want to eat one of these rolls now! I used your pineapple cutting method last night and it was a huge success! Thanks again. These look amazing! Is it possible to assemble the night before and bake in the morning? I want to make them for a breakfast at work but I won’t have time to make it all in the morning before I have to go to work. Thanks in advance! Hi Rene! That’s such a great question and I’m so glad you asked. What you are going to want to do is to make and assemble the night before, like you said. Let them proof for around a half hour before you put them in the fridge. Then, the next morning, take them out and let them come to room temperature. They should puff up even a little bit more. Then, just bake them off just like it says in the directions! I think it will work out just great! I hope you enjoy them as much as my son and I did! Well, I suppose you could try it with refrigerated bread dough? I have never really done it though so I can’t guarantee the results. Good luck and I hope you enjoy! Who doesn’t like sweet and beautiful rolls, right? 😀 That cream sounds so delicious! Thanks Milk and Bun! They were really delicious and so fluffy. I’m so glad you stopped by- thanks so much for the sweet comment! Pingback: 50+ Recipes for Summer ~ Grilling, Salads, Ice Cream, Drinks, & More! Thanks for this delicious recipe…Hugs from Chile. You are quite welcome Muriel! I’m so happy you like the recipe- hugs to you too! I made these today and they are delicious. I changed it up a little bit. Instead of adding milk to the glaze topping I used some of the juice from the pineapple. I also added coconut extract instead of vanilla and topped the whole thing with toasted coconut. So tropical. Makes me think of our trip to Hawaiian and pina coladas. I tried one before I’m sending it off to work with my husband. I doubt they’ll last more than 10 mins. Lol. Thanks for sharing the recipe. So happy you and your wife enjoyed! Thanks for the great feedback!